This turned out to be so delicious, I want to put it, on the weekly menu. It was filled with flavor from such basic spice and a tiny bit of ketchup. I rarely use ketchup in anything. Am I missing something. I actually frowned when I saw the ingredients but stayed with the recipe because it was called EASY and easy was what I wanted. Easy it was to make and as I said, it is a tasty treat for a quick dinner. I knew that this would be waiting to be made when I came home from work so I asked hubby to prep a little for me. It was great. He cleaned the mushrooms, put up water for the noodles and browned and drained the chopped meat. Maybe, that was why it was so easy to make. Regardless, I plan to put this on the menu quite often. In large skillet, brown the ground beef in small chunk-like pieces and drain off any excess grease. Add onions to ground beef mixture and cook just until onion has softened. Add the oil; stir in the flour and cook for 1 minute, stirring constantly. Slowly stir in broth. Add the remaining ingredients, except for the sour cream. Bring sauce to a boil, reduce heat and simmer on low until sauce thickens, about 3 minutes. Yum, I love strog - this looks so good. I love the flavors in your Beef Stroganoff. Thanks so much for sharing with Full Plate Thursday and hope you are having a great week. Chaya, I live beef stroganoff. And I also love easy! Thank you for sharing. 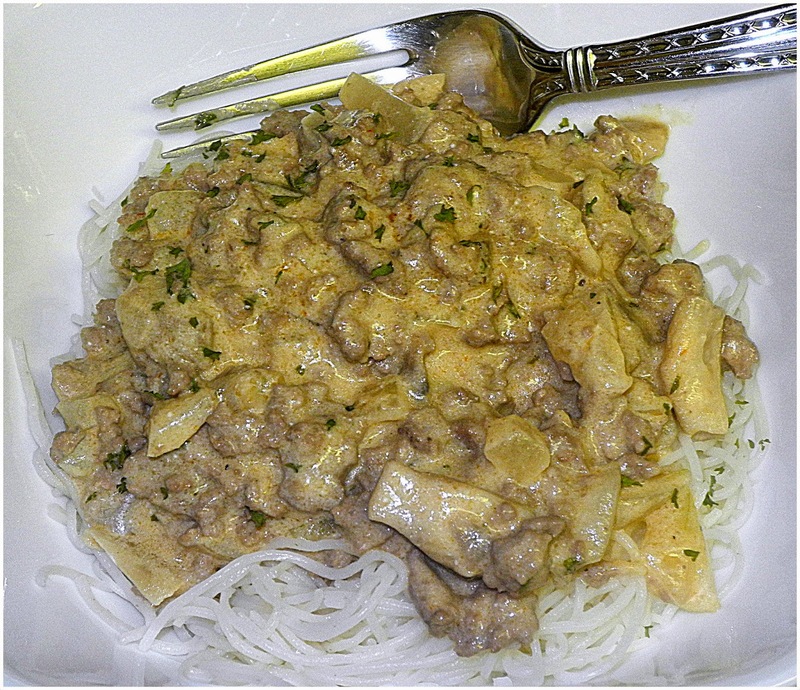 Your stroganoff was one of the top-viewed links at See Ya in the Gumbo this week.